Last Saturday had me frazzled. Several days had passed without a word from Adventure Girl. We were worried. By we, I mean AG’s parents, Aunts, Uncles, etc. However, if you read the post last week, you know we finally received a SPOT update and AG was fine. For the record, Adventure Girl was actively posting to SPOT. However, if the batteries are not working, the updates will not go through. Remember that fact, future hikers. On July 3rd, Adventure Girl was located off I-93 near Highway 112 in New Hampshire. She was officially in the thick of the White Mountain National Forest. 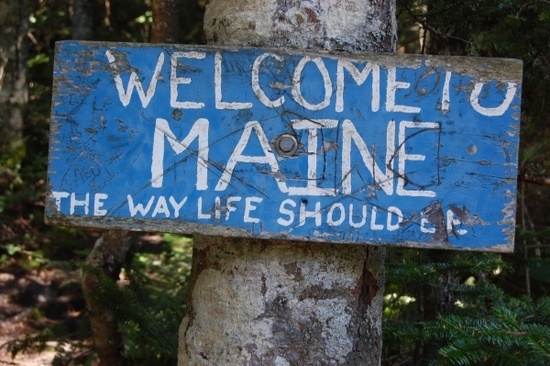 Pushing herself hard all week, Adventure Girl will enter the great State of Maine today. Based on the Appalachian Trail Distance Calculator, Adventure Girl has traveled 47 miles since Monday July 5th. Apparently, close to half the mileage was covered in a day with her 21-mile hike. Adventure Girl plans on returning to Georgia on August 6th. She’s not sure when she’ll finish her hike, though she is aiming to finish before July 29th. Today is July 9th. Adventure Girl has a mere 20 days left. 20 days. Can you believe her journey is nearly complete? Seems like yesterday I started Adventure Girl Trail Tales … though I am guessing the time has passed more slowly for Adventure Girl. Where Adventure Girl's Trail Tale will take her today. Road Trip! What a blast! Amazing Girl your AG! My daughter, her husband and in-laws motor biked from Lake Tahoe to Yosemite over the past few days. I’m keeping all those adventureres in my thoughts and prayers. She is amazing, Georgette. Truly. The adventure your ‘kin’ is having sounds exciting. I can only imagine the picturesque views they are seeing. Thank you for keeping AG in your thoughts and prayers, Georgette. Congratulations. As they say in Maine, “Ayuh, thay ah’s a goodun’.” Continued happy hiking AG!! Too funny, M2M. I’m sure AG is becoming giddy with the approaching ‘finish line’. Wow! Can’t believe she’s almost finished. Glad to hear she’s doing well and her spirits have picked up. I hope she enjoys the rest of the trail to the end. I cannot believe she is almost done, either. It’s been a whirlwind. And, I was happy to see her spirits picked up, too, Jacqueline. That will help carry her the rest of the way, I think. She’s so close to me right now… fifteen minutes. Let me know if she needs anything! Any takers…I want to go! I’m in for a mile – maybe two. We’re talking flat paths, right? Maybe I could manage three miles. Ice cream afterwards, and it’s a deal! Adventure girl is amazing! I look forward to her updates. Thanks Young American! I received a new picture of Adventure Girl today. I can’t wait to share it with everyone this weekend. I’m so proud of her. Well thanks, SIG. I cannot take credit for the picture, though. I pulled it of the AT website. HIkers post lots of great pictures from their hikes. Adventure Girl sounds like an extraordinary young woman – this is a serious quest she’s taken on, and while I’m sure she’s been enjoying it (after all, someone who doesn’t like hiking wouldn’t begin such a journey) I’m sure it’s also been incredibly difficult. I’m sure she’ll feel immensely accomplished by the time she gets home! I hope you’ll come back on Saturday, when I post the next update. It will more than likely be the last update until she crosses the ‘finish’ line around July 27th.